Bayside Pavers Are The Pool Deck Installers San Francisco Bay Area Homeowners and Businesses Rely On! Today, pool deck design is a creative art. In the past, the typical pool deck was made from poured concrete or timber. This meant that your pool deck looked exactly the same as your neighbors. Not anymore! Today, thanks to a variety of new materials and creative design, your pool can perfectly match your existing outdoor hardscaping, drawing its inspiration from the color palette and architectural details of your home to perfectly reflect your unique personal style. Concrete Pavers Are The Perfect Solution For Your Pool Deck! Concrete pavers are the perfect choice for your pool deck. Not only are they aesthetically beautiful, but they're also durable and last for years while requiring little maintenance. They are resistant to stains, spills, chemicals, sun, salt and anything else that comes their way. Materials like poured concrete, wood or tile often crack allowing water to infiltrate under the surface causing further damage. Unlike these traditional materials, patio pavers will never crack. 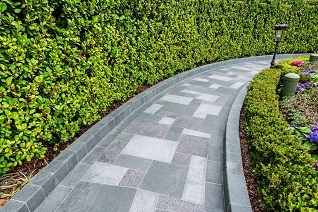 Because of the way they are installed, pavers a flexible and will shift along with the earth. Their flexibility also makes them stand up to weather changes, and when properly installed they will not crack or change position. A concrete paver pool deck is functional, safe and aesthetically beautiful. It can become the focal point of your entire outdoor space. Plus, adding a paver deck to your pool is not only visually stunning, but it can also add considerable value to your home when it's time to sell. With the wide variety of styles, textures, patterns, sizes, and shapes of pavers available, you can create a custom look to fit your style. Pavers are easy to clean and when properly installed will last for decades. They're also the perfect pool deck solution. If a pipe breaks under a poured concrete deck, that section of the deck must be cut away to fix the problem. When patched, that section of your pool deck will never look the same. When your pool deck is constructed of pavers, repairs are easy. Because they interlock when there's a problem merely lift the pavers in the affected area, fix the problem, and replace the pavers. Your pool deck looks as good as new. There are plenty of other reasons pavers are the perfect option for your pool deck. Even after baking in the hot sun all day, pavers remain cool and comfortable. Some textured pavers even feel soft on bare feet. Thanks to their texture, these pavers are slip-resistant, providing a safe environment for your pool area. Pavers also resist algae growth, so they remain safe for the whole family, even when exposed to large amounts of water. Call The Pool Deck Experts at Bayside Pavers Today! If you're planning on creating a pool surround for your San Francisco Bay area home, give the experts at Bayside Pavers a call at 1-866-287-2837. We can help you design the perfect pool area to meet your family's unique needs. Our knowledgeable team members are ready to help you create the outdoor living space you've been dreaming about!